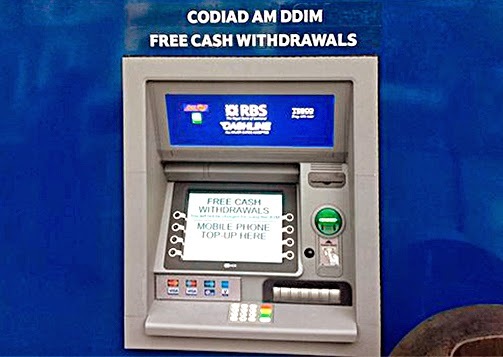 Angie J was more than a little surprised the other day when she came across this ATM outside a new Tesco Express in Aberystwyth town centre offering Welsh speakers a degree of largesse not normally associated with bankers. That's Bankers for those of you whose ears suddenly pricked up. We've come to expect free cash withdrawals. But free erections? Now that is big. OK. It may serve to underline the somewhat diverse benefits to be enjoyed from a hole in the wall by certain of those who live among us. But to ask a Welsh speaker to check a few words before going public? Surely it's not that hard.